Chandrababu Naidu had promised a Group-I post to Sindhu when she won the silver medal in Olympics. Accordingly, she was appointed the deputy collector. The state government has issued orders in this regard, mentioning that PV Sindhu is appointed the deputy collector, asking her to report to the concerned commissioner within 30 days. Olympic silver medallist P V Sindhu who has won million of hearts for her amazing performance in Badminton has been appointed a Group-I officer in Andhra Pradesh. Chief minister N Chandrababu Naidu handed over the government order to the Rio Olympics silver winning shuttler on Thursday. 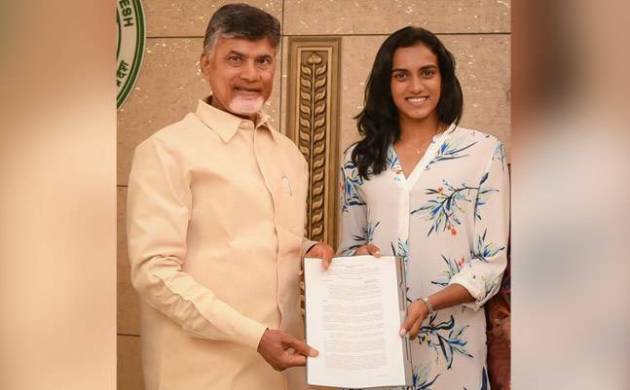 Presenting the offer letter, Naidu said he was hopeful that Sindhu would bring more medals to the country in future. Sindhu has expressed happiness over her appointment and clarified that badminton is her first priority, adding, she would concentrate on this sport. 1. P V Sindu's full name is Pusarla Venkata Sindh. She Was born on 5 July 1995 in Hyderabad. 2. She hails from a sports background family. Her parents were professional volleyball players. 3. Sindhu took up badminton at the age 8, she used to travel 50+ Kms every day to reach her training centre in Hyderabad. 4. After being inspired by Pullela Gopichand’s success, she chose Badminton. Presently, Gopichand is her coach. 5. She won the World Badminton Championship 2 times in a row in 2013 & 2014. Sindhu has also won Macau Grand Prix Open three times in a row. 6. PV Sindhu is the youngest Indian to win an Olympic medal. 7.The 21-year-old shuttler has been working with Bharat Petroleum Corp Ltd (BPCL) since 2013 and is currently an assistant manager (sports) at its Hyderabad office. 8. She received Arjuna Award at an age of just 18-years. 9. Sindhu is the first and only India shuttler to reach finals of badminton event at the Olympics. Although Sindhu had missed out on gold in Rio de Janeiro, she scripted history by becoming the first Indian woman athlete ever to win silver at the Olympics. 10. Sindhu was awarded India’s fourth highest civilian award Padma Shri for her contribution to badminton.